FILE - In this photo taken June 24, 2010, a fruit farmer points to a factory's chimney that blowing smoke from behind a backyard of his home near Map Ta Phut industrial estate in Rayong province, southeastern Thailand. Thailand’s industrial development faces fresh calls for greater local community participation in addressing the challenges of environmental pollution, especially as reports point to an escalation in the production of hazardous industrial pollution. Industrialization has been a core of Thailand’s economic progress over the past three decades as the country progressed from agricultural to industrial and manufacturing development. Investments in major chemical and manufacturing industries have been marked by industrial estates, especially in the Eastern Seaboard some 150 kilometers from Bangkok. The military government is now looking to expand industrial development to boost the economy through 10 special economic zones throughout the country and further investment near Bangkok by way of an Eastern Economic Corridor (EEC). But Thailand’s push for growth has raised concerns by local communities about increasing pollution, despite controls and legislation. 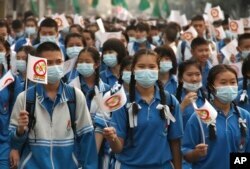 FILE - Thai schoolchildren wear masks and march on the street in a campaign to fight against the haze and smog in Chiang Mai province, northern Thailand, March 19, 2012. Thailand’s Pollution Control Department (PCD), in its latest report, estimates some 37.4 million metric tons of industrial waste was generated nationwide in 2015, of which 2.8 million tons — or 7.5 percent of the total, were hazardous industrial waste. At the same time, hazardous waste — covering all waste from communities, industrial activities and infectious waste — stood at 3.45 million tons, an increase of 28 percent from the previous year. “The production and use of hazardous substances in the country has caused pollution as hazardous substances were released into the environment and may cause contamination or remain in the environment,” the PCD said. A European Union funded report with the Thai-based Ecological Alert and Recovery Thailand (EARTH) and Prague-based University of Chemistry and Technology covered eight provinces and the impact on local communities from dangerous heavy metal pollution. The heavy metals examined in the study included arsenic, mercury, zinc, cadmium, chromium, and lead along with organic contaminants such as polycyclic aromatic hydrocarbons and petroleum products, which medical authorities warn can be potential dangers to health. Key areas of concern were the eastern seaboard industrial areas of Map Ta Phut and the provinces of Samut Sakorn Saraburi and Praeksa — which was affected by leakages from industrial landfills into the local environment. Marek Sir, a chemistry researcher from the University of Chemistry and Technology in the Czech Republic, said the studies indicated concerns over heavy metal pollution in areas near industrial plants. “In some areas there are real problems with the mixture of heavy metals or with the mixture of pollution. I was surprised mainly by the levels of heavy metals around recycling plants and smelting plants,” Sir told VOA. “That’s a problem — still there are toxic fumes released into the environment and the easiest way to spread the pollution of heavy metals, which are absorbed on solid particles and they can diffuse into the air and can be transported. So that’s the problem — one of the problems,” he said. EARTH director Penchom Saetang said there is a need for local communities to participate in the studies or projects in the future, as well as taking part in any process to rehabilitate affected polluted areas or studies. Thailand has more than 139,000 large and medium-sized industrial plants, both inside and outside industrial estates and parks which number some 87 throughout the country. The EARTH/ARNIKA report accused factory owners responsible for pollution of “uncaring management,” with the result of water pollution, toxic air pollution and hazardous industrial waste — especially those mismanaged and illegally dumped. Contaminated areas are often not restored with local people increasingly lacking trust in officials and the state, and leading to opposition to further industrial development. EARTH director Penchom said access to funding for land rehabilitation remains a major stopping block. “The big problem is rehabilitation and remediation will consume lots or money. I think the private corporations and the polluters are not willing to pay and this is the fundamental cost in Thailand. It’s very difficult to enforce the law for the polluters to pay,” she said. 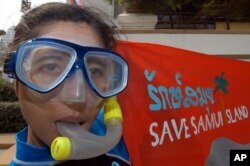 FILE - A Thai activist from Greenpeace holds a banner in protest of toxic pollution of Samui Island in front of the Tourism Authority of Thailand in Bangkok, March 8, 2005. Greenpeace Thailand country director Tara Buakameri said too often environmental policy depends on “top down” decision making, failing to address the pollution at the source. Tara said policy often compromises the environment to the benefit to industry and development. “It is a compromise situation – the compromise that benefits the polluter, benefits irresponsible companies that pollute the environment. When we can see that the result from the toxic contamination in different regions in Thailand — also affects the community,” Tara told VOA. He said communities have a “right to know” when pollution has occurred and the amount and toxicity to be able to respond and to seek solutions and treatments.